One of the most common methods that is used to preserve foods is canning. This is also the method used for preserving jams and various other types of foods. One crucial aspect of canning is preventing poisoning due to tainted foods. Meat is a food some people might be apprehensive about canning. If you have meats you want to preserve, then knowing how to can meat safely will be beneficial. The proper equipment is needed to can meat safely. This means you need to research to find all the supplies that will be necessary for this task. The most important item to have is a pressure cooker to reach the required temperature to kill stray bacteria. Pressure cookers are not as easy to find at local stores as they once were, but you might be able to find one at a reasonable price online. If that is out of the question for your budget, you might have to borrow one or look for a used one. 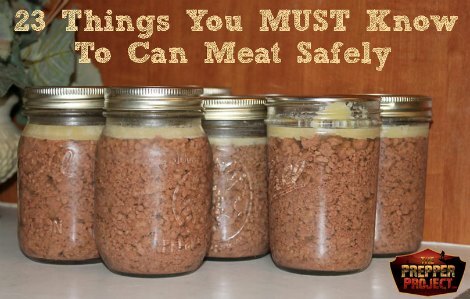 Mason jars will be the best option when you want to can meat safely. These are almost always the best choice for any type of canning. You can find mason jars at most supermarkets, online, and any stores that have cooking supplies for sale. There are many recipes that can be used to can meat safely. The reason to follow a recipe is to ensure the meat is cooked long enough to make sure all bacteria is eliminated. You will also need to sterilize your canning supplies by putting them in boiling water. If you use any tools that might be contaminated with certain kinds of bacteria, then a batch of canned meat could potentially cause botulism or worse.